Located: In the Tararuas. Waiarapa. Closest town is Masterton. Track leaves from Mt Holdsworth road end. Access: About 3 hours max of walking time with a 4 and 6 year old, maybe a little bit less. This doesn’t include stops. That maybe added on 30 minutes or so. You walk alongside a river and there are a number of places where you can go down to it. Hut features: Excellent condition. Best to book a bed online before you go as quite popular with families. There were unbooked people sleeping on the floor the Saturday night we were there. Right next to a river. Other huts to walk to. We just went in and out for the night, but other groups with kids had been there for two nights and done a day walk / played at the river for a day. Lots of bridges and swing bridges on the track. Our kids enjoyed counting them! Issues: Track in excellent condition. There was one small slip on the track when we went. Not bad, but had to be scrambled around. 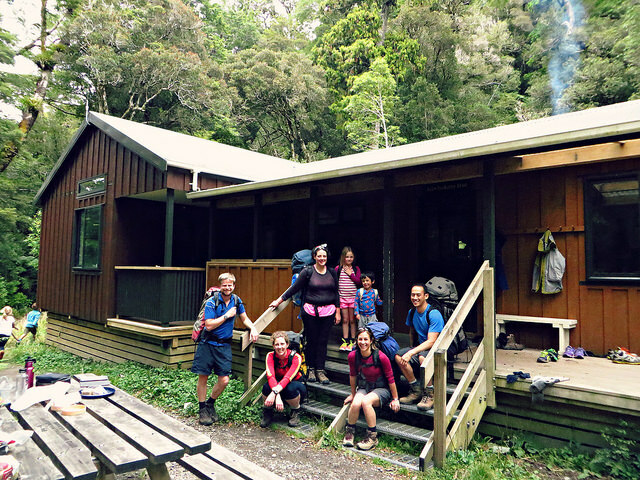 We’ve just been to this hut with a six year old for his first overnight trip. The slip has got worse, but it’s very easy to cross by following the old path down to the river bed. The river makes it a great spot – kept 6yo entertained at 630 am while others were still asleep!